Beer is awesome. It’s really the only alcoholic beverage that’s equally welcome at baseball game or ritzy banquet, dumped into a Solo cup or slowly poured into a crystal pilsner glass, enjoyed shirtless after a long afternoon mowing grass or with a perfectly marbled Wagyu ribeye after you seal the business deal of a lifetime. You already know how to pack a cooler full of Schlitz and party by the BBQ with your buds, so in celebration of National Beer Day on April 7th, we’re taking another look at the quickly evolving world of brews and giving you some of our favorite, more refined options for buying, making, and otherwise enjoying beer. So, you’re stuck in a rut. The same six pack of IPA hits your grocery cart every Friday, and it’s delicious but…. boring. Enter TapRm. This innovative delivery service brings microbrews straight to your front door, and they’re not charging a premium, either; most of their inventory is available at cheaper-than-retail prices. Check out themed variety packs focusing on female brewers or bittersweet beers, or assemble your own box from a list of award-winning favorites and TapRm exclusives. The big drawback? Currently, TapRm is only available in New York, but they have plans to expand. If dirty bars filled with smoke and the stench of stale beer don’t exactly get your heart racing, you’ll be glad to hear that taprooms are opening at a rapid pace all across the country. Some breweries are expanding operations to include new locations while other launches feature brand new names and beers. Massachusetts alone is set to see five new taprooms this year (and a whopping 36 new breweries! 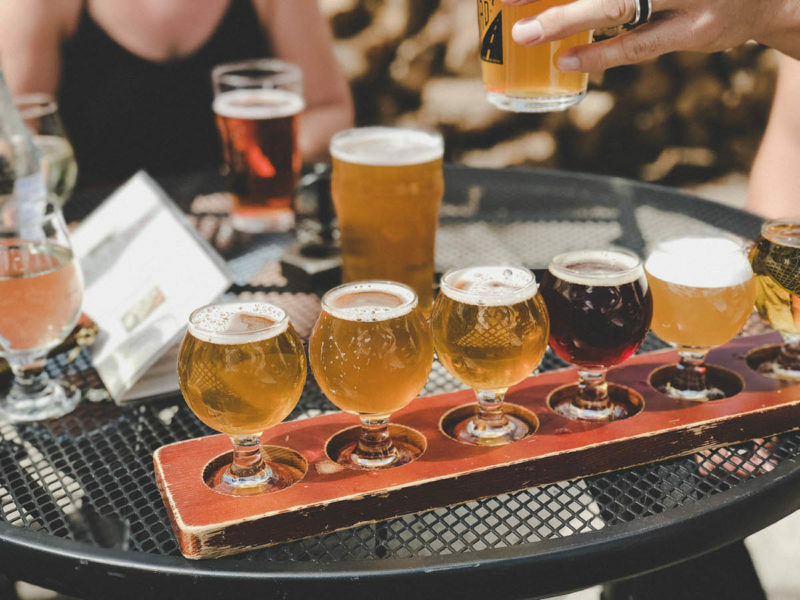 ), and outlets like Drake’s Brewing Co. in Northern California, and Crooked Stave in Fort Collins offer perks such as indoor/outdoor seating, mouthwatering menus, and craft beers galore. It’s all the communal atmosphere you love from traditional pubs but with an elevated air that makes you feel like you can come in a suit or bring a date and not feel even a tiny bit smarmy. Drake’s Dealership in downtown Oakland is a beer garden and full service restaurant inside the shell of a former Dodge Dealership and repair shop. Gletsos’s current focus is on producing a series of small-batch brews using local ingredients he forages or otherwise finds himself: lichen, turkey-tail mushrooms, sumac, citrus, beans, squash, corn, pine tips, yarrow, and more. The result is a collection of complex, intensely aromatic beers that are full of unique flavors. They’re downright transportative, really, and about as far from watered-down light beers as you can get. You can drink beer out of almost anything, including the can or bottle it came in, but for maximum enjoyment, you should invest in glassware designed to show off the best qualities of each beer. Spiegelau has taken that mission to heart with their line of craft beer glasses that have been meticulously workshopped and subsequently approved by industry professionals and a glitzy panel of master brewers. Each vessel is custom shaped to deliver the right texture, aroma, balance, and flavor profile. From the rippled stem and tulip top of the IPA glass to the sleek stem and flared lip of the glass made especially for barrel aged beer, these works of art are both functional and stylish. Try them the next time you break out a saison or fruity Belgian ale and taste the difference. Sometimes it feels good to have the beer everybody wants. Sometimes it feels better to have the beer nobody else can get—or even knows about. Seattle brewery Floodland is taking the opposite approach from the majority of today’s craft houses and eschewing a wave of publicity and social media blitz in favor of extremely limited access, secrecy, and the consumer urgency those kinds of restrictions create. If you want to drink some Floodland, you have to join their bottle club. Floodland has no taproom. You can’t get their beers at the supermarket, and even their website is extremely bare bones, consisting of a blank white page, a box for subscribing to their mailing list, and links to text files about their products. If you want to drink some Floodland, you have to join their bottle club. If you want to learn more about what they’re up to, you can check out their Instagram, but posts are nothing short of sporadic. It sounds like an awful lot of hoops to jump through, but the truth is, it’s all worth it. Floodland is a critical and commercial darling thanks to soft, balanced beers the owner calls “drinkable”. For once, that’s not a subtle dig but rather a proud declaration that these bottles are made for people who love beer as it is, not for all the flavors, complexities, and strange character sometimes injected into it. Not every beer drinking experience needs to be dripping in sophistication—in fact, some of the best days are those that come to close with a cold brew in a frosty can sipped from the dusk-lit comfort of your front porch. But for those times when you crave something a little, well, more, the items above should get you exactly where you want to go.